Fiction – paperback; Mulholland Books; 240 pages; 2017. Translated from the Japanese by Philip Gabriel. A few years ago I read Kanae Minato’s debut novel Confessions about a teacher who accuses two of her pupils of a terrible crime, then seeks vengeance on them. It was a compelling read, but incredibly dark — and it didn’t exactly chime well with my moral compass. Penance is Minato’s second novel. It charts similar territory but isn’t quite as dark. It still deals with the notion of vengeance and murder, and posits the idea that if you’re a witness in a crime case but can’t remember crucial details that may help catch the culprit, then you’re not much better than the criminal who carried out the act. It’s the kind of story that throws up lots of questions about moral culpability, justice and retribution, and it makes for yet another compelling read. The book pivots around one central act: the murder of a 10-year-old school girl in rural Japan. Her four friends — Sae, Maki, Akiko and Yuko — are with her when a stranger approaches them and asks for help. Civic-minded Emily goes off with him, leaving her friends behind. She is never seen alive again. The surviving girls, horrified by what has happened, cannot recall the face of the stranger and offer little in the way of detail that might help track him down. A couple of years later Emily’s mother, half demented by grief, needs someone to blame. She approaches the girls with an ultimatium: if they do not find the murderer they must atone for their crimes, otherwise she will have her revenge on them. The novel is divided into six chapters. Each character — Emily, her four friends (now in their mid-20s) and Emily’s mother — get their turn to tell their story. Not only do we hear their different viewpoints about what happened on the day of the murder, we learn how the murder impacted the rest of their lives. This does mean that some events are hashed over again and again, but this repetition doesn’t detract from the overall narrative: it simply allows you to see how different people interpret the same event in different ways. To complicate matters further, each chapter is told in a different style — for instance, one takes the form of a letter to Emily’s mother, another is a confession to a counsellor — which can make Penance feel less like a novel and more like a collection of short stories. But the overall effect works. Minato weaves a deft tapestry of human emotions, motivations and contradictions. And in her stripped back, almost limpid prose, she’s able to show how different personalities not only react to a single event in different ways, but she expertly charts how the girls’ lives and career paths veer off in different directions in the years following Emily’s death. This makes for a powerful read. Perhaps the book’s main failing is its slide into becoming ludicrous — it’s difficult to elaborate without giving away spoilers. But let’s just say the ways in which the girls atone for not catching Emily’s murderer lead them to carry out their own devastating acts with long-lasting repercussions on other people. 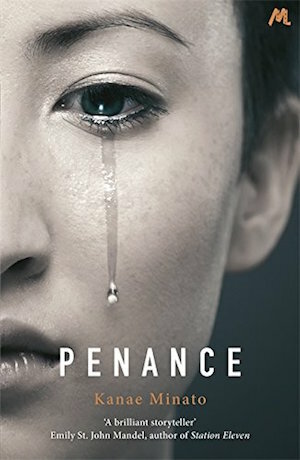 Penance is not your typical crime novel. The murderer himself is almost incidental to the story: it’s not about who did it, but what happens to those who survive. A subsidiary narrative thread that runs throughout each of the girl’s individual stories fleshes out the idea that we are all capable of hideous acts if the circumstances are right. It’s not quite as brilliant as Confessions, but this is an intriguing read if you’re looking for something a little different. Agreed. I wonder why that is? A dissatisfaction with the justice system? Or part of the Japanese psyche? Either do I. I will have to ask Sakura, in my book group, for her thoughts (she is half Japanese). Do you get to identify with any one character? I can see how it might drive the mother mad, having witnesses and no description.